By now we’ve likely hammered home the value of email marketing, marketing automation and CRM. But without inbound leads to use these tactics on, you’ll be wasting your time and worse, your business won’t have the ability to grow. A business website should be at the heart of your marketing strategy. Without it, your business has no digital presence and no way to capture leads. If a full-blown website isn’t in the cards for you due to budget, ability or other mitigating factors, a landing page will more than suffice. Creating a page that’s worth its weight is a different story though. There are several factors that go into building a landing page that converts – content, a lead capture form, visual aesthetics – and the idea of creating a landing page that works may seem daunting. Lucky for us all, there are plenty of tools out there to take the pressure off and to easily create beautiful, effective landing pages that will capture the traffic you’re driving. One of our favorites is Unbounce. 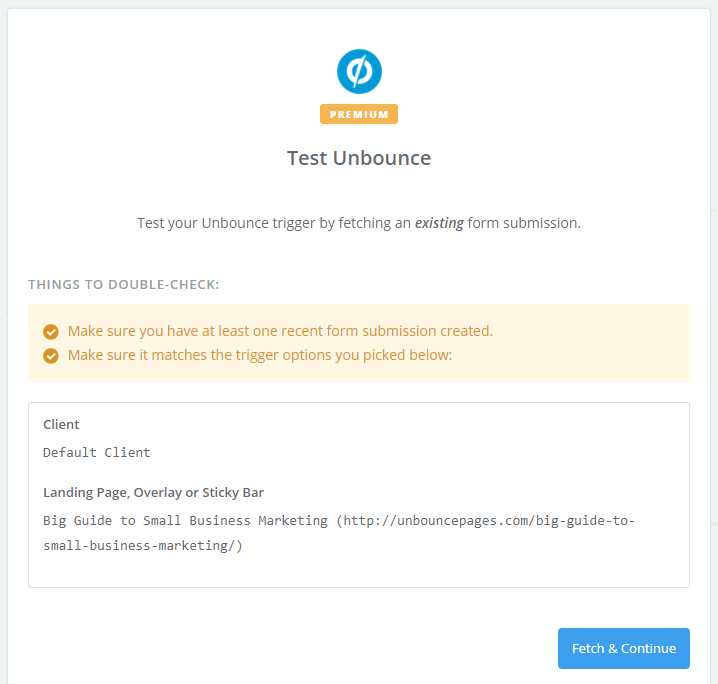 Unbounce is an easy-to-use landing page builder and conversion tool that integrates easily with other tools (like Hatchbuck) through Zapier. 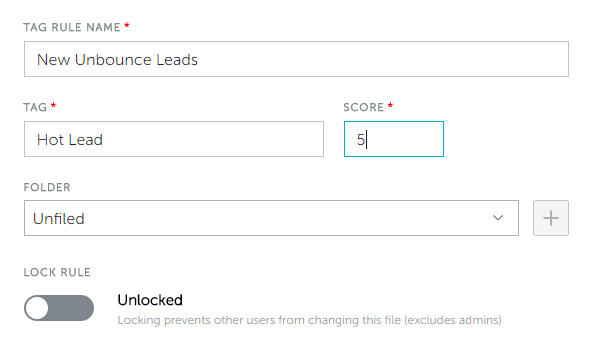 Through Zapier, you can easily capture leads from your Unbounce landing pages and push them into your Hatchbuck database for nurturing. Similar to our drag & drop email builder, Unbounce requires absolutely zero design or coding experience. 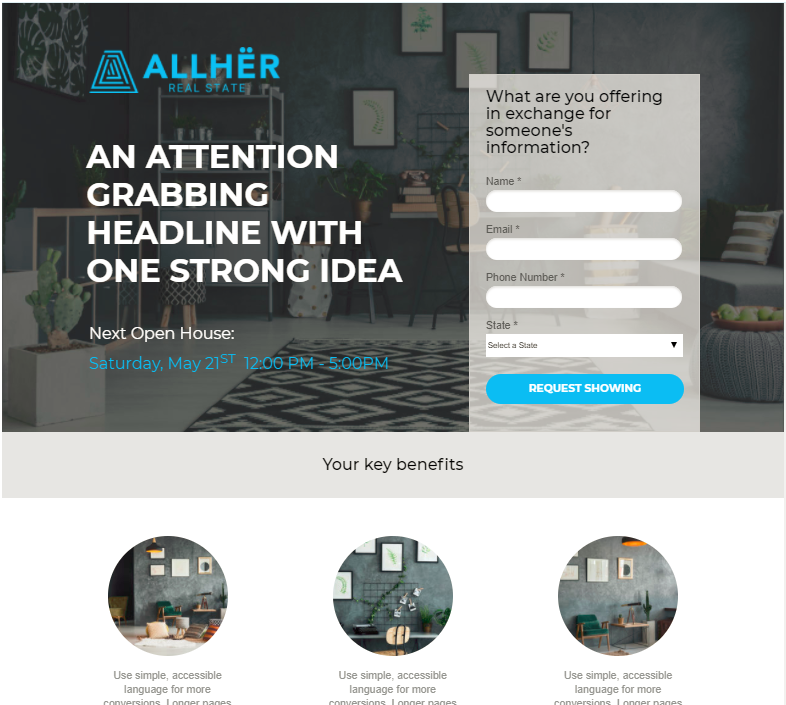 They’ve got a pre-designed template library chock full of professional-looking landing pages and popups that are sure to help you capture more inbound leads. The ability to create a branded, mobile-responsive landing page is an absolute must for businesses large and small. With some many beautifully designed websites and talented web designers out there, it’s easy to feel like a small fish in a big pond. But tools like Unbounce, it’s easier than ever to compete no matter your size or budget. 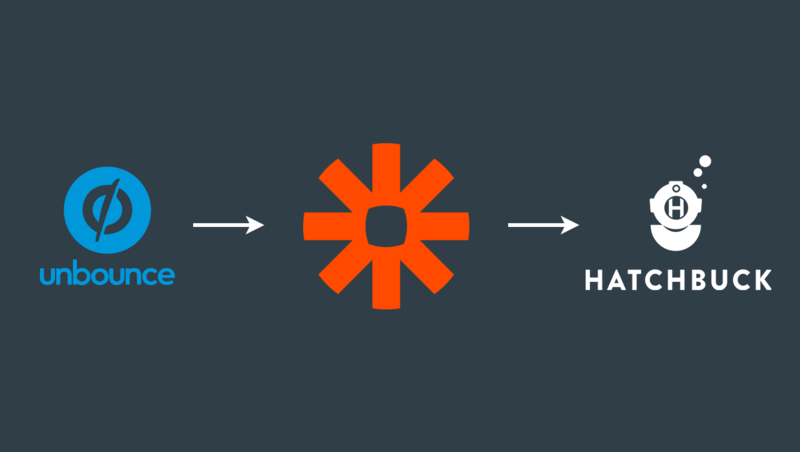 Once you’re logged into your Zapier account, choose “Make a Zap!” to get started. 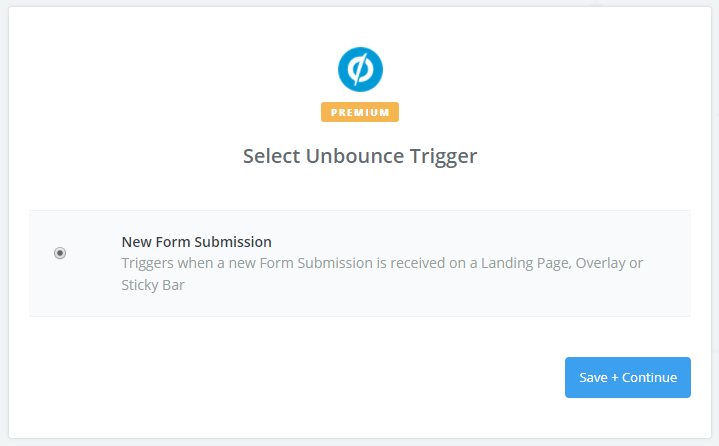 Select Unbounce as your “Trigger App” in Zapier. Select “Form Submission” as the trigger for your Zap. 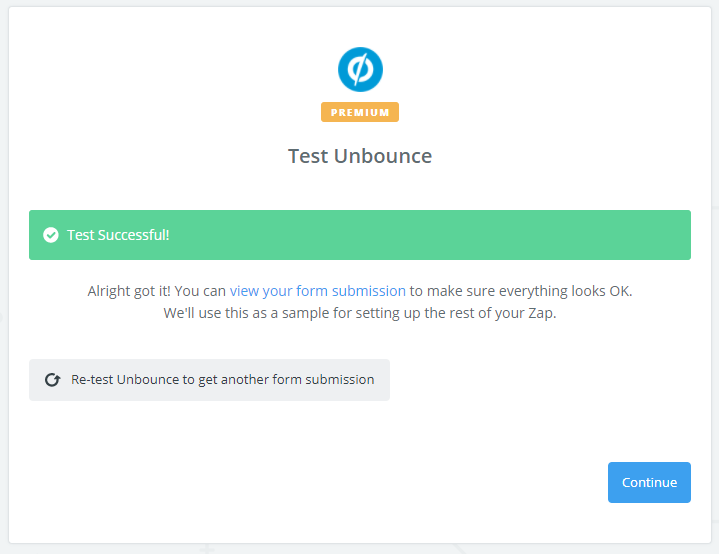 This means that the zap will fire every time someone submits a form on your Unbounce landing page. Choose the Unbounce client and Unbounce landing page you want to connect to. Now, choose your action app. This is where you’ll choose Hatchbuck! You can test to make sure your connection is working properly. 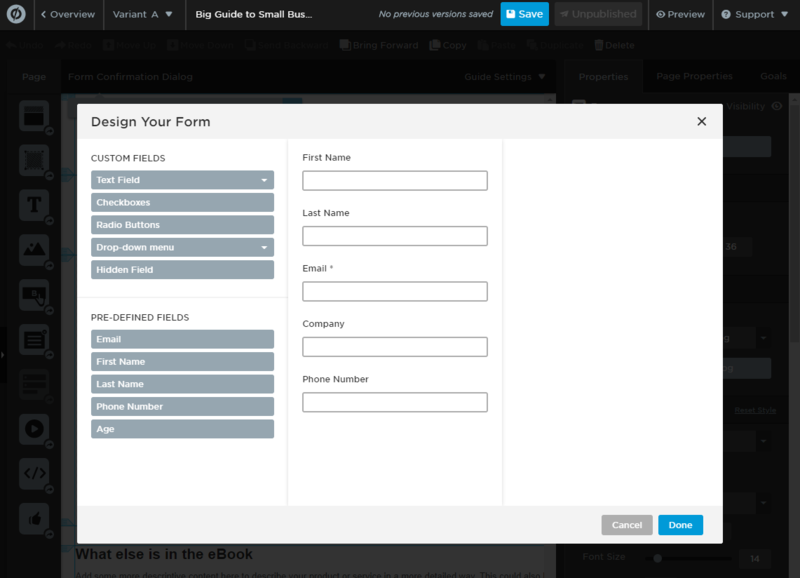 Choose the tag you’d like to add to leads that fill out your Unbounce form. 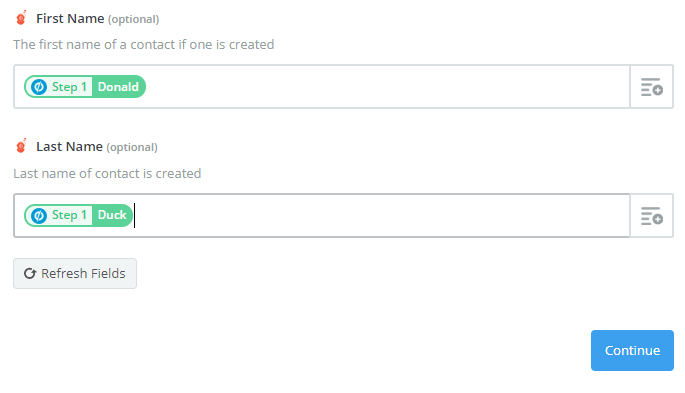 Choose the email address field you’d like to import. 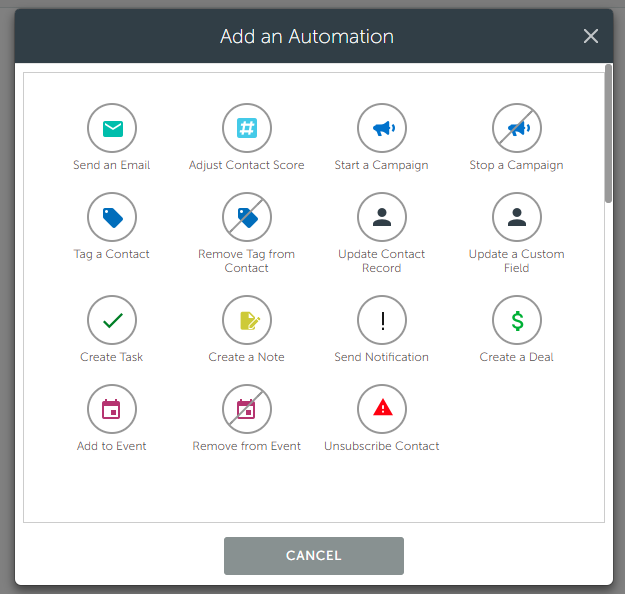 This is the Unbounce field that collects the email address. It may show an email address from the test data pulled from your Unbounce test. This is just to make it easy to see what data your fields will be pulling in. In this example, we can see that our test pulled “donald.duck@unbounce.com” from the “Form Data Email” field. That looks right! 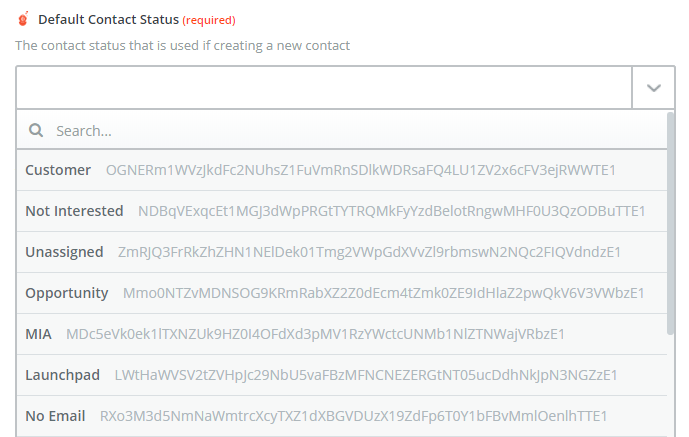 We’ll choose the “Form Data Email” field to populate our contact record in Hatchbuck. 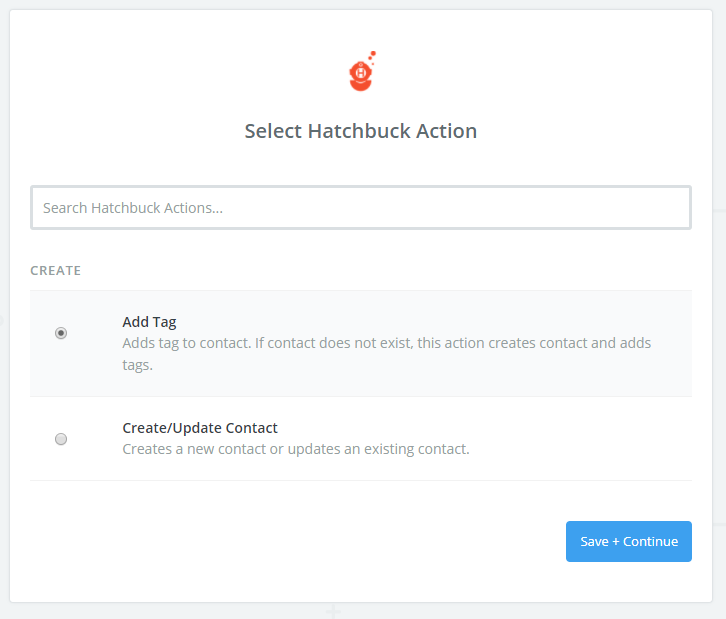 Select the contact status you want to give new leads who come from your Unbounce landing page to your Hatchbuck account. Add the first name and last name fields from Unbounce. Helpful hint: Back in Unbounce, make sure you’re asking for separate First Name and Last Name fields, rather than just one “Name” fields. This will keep your data nice and clean as it comes into Hatchbuck. 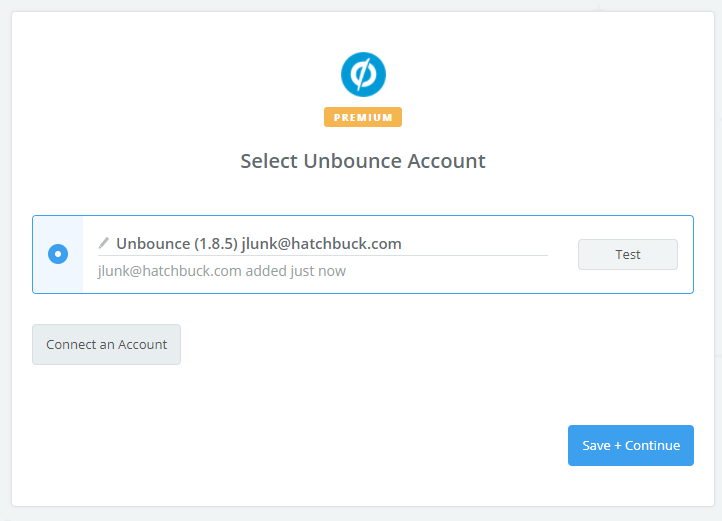 Send a test tag to Hatchbuck using your test Unbounce data. Success! You’re ready to name your zap and turn it on! 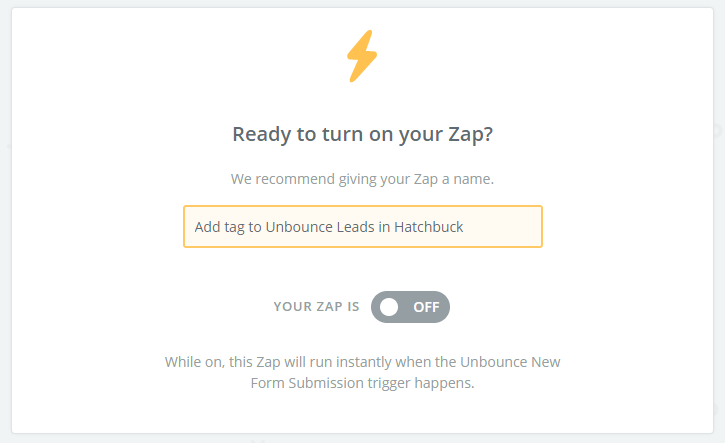 Now, Zapier will add any new leads from your Unbounce landing page form to Hatchbuck and add the tag you selected to them. Back in Hatchbuck, go to your Tools > Rules. 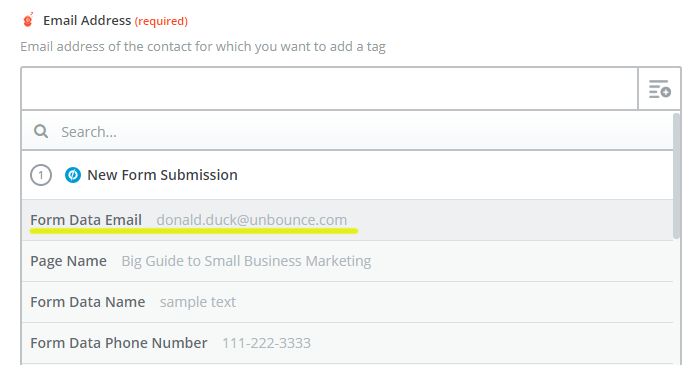 Give your Tag Rule a name, and find the Tag that you’re adding to your Unbounce leads from Zapier. The sky’s the limit, but in this example, we’ll just add a task for a sales rep to follow up with the new lead. There you have it — you’re all set up! 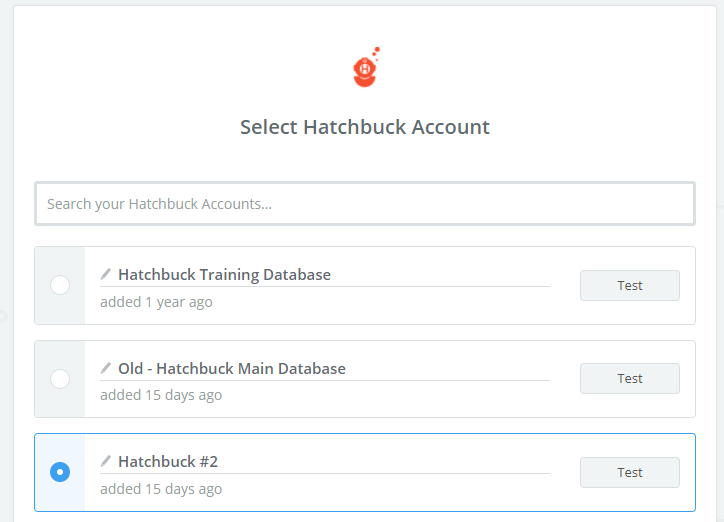 See other Hatchbuck integrations in our full Zapbook. Happy Zapping!